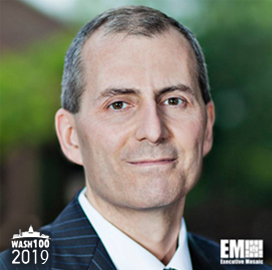 Executive Mosaic is honored to present Craig Abod, president of Carahsoft Technology, as an inductee into the 2019 edition of Wash100 — Executive Mosaic’s annual selection of influential leaders in the government contracting arena — for delivering IT platforms and expanding opportunities in the federal marketplace. This latest honor marks his fifth Wash100 Award win. Since founding Carahsoft in 2004, Abod has led the company in its efforts to provide technology support to more than 3,000 prime contractors, value-added resellers, system integrators and other channel partners. Carahsoft was recognized for its performance in the federal marketplace. Bloomberg Government included the company among its top 200 list of federal contractors in July 2018. “The expanding opportunities across the federal marketplace provide Carahsoft and our reseller ecosystem more opportunities to meet agencies’ unique mission needs and modernize IT infrastructures with cutting-edge solutions and services from our technology manufacturer partners,” Abod said. The company, based in Reston, Va., also made the CRN Fast Growth 150 list in 2018 and the Washington Business Journal 2018 list of top 100 privately held companies in the Washington, D.C. metropolitan area as measured by total revenue during the previous fiscal year. Carahsoft ramped up its efforts in 2018 to bring more IT products and services to federal, state and local government agencies through partnerships with select technology vendors. In June, the company agreed to resell the VMware Cloud on AWS offering to the government market. One month later, it expanded its partnership with Qualys to offer the latter’s cloud security platform to agencies. Carahsoft teamed up with Feature Labs in July 2018 to market the latter’s data science automation tools, a move Abod said could expand Carahsoft’s machine learning and artificial intelligence offerings to public sector clients and resellers. Carahsoft closed 2018 on a high note after AWS added Carahsoft as an authorized distributor to its public sector distribution program.